Sunday Cinema continues at the Trove this month with a great selection of new and classic family films. Here’s a quick look at some of the titles we’ll be showing at 2:00 p.m. in Galaxy Hall throughout the month of December. Note: we have one extra weeknight film on Wednesday, December 20. This is the very popular sequel to the Disney Channel Original Movie Descendants and it continues with an exciting story and great soundtrack. Rated TVG, 111 minutes. The wildly popular animated Disney hit for all ages. It is the story of Anna, a fearless optimist, who sets off on an epic journey – teaming up with rugged mountain man Kristoff and his loyal reindeer Sven – to find her sister Elsa, whose icy powers have trapped their kingdom in eternal winter. Rated PG (some action and mild rude humor), 102 minutes. 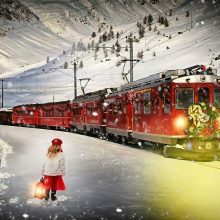 Celebrate the holiday spirit with this popular Christmas movie, The Polar Express. On Christmas Eve, a doubting boy boards a magical train that's headed to the North Pole and Santa Claus's home in this film based on the classic story by Chris Van Allsburg. Rated PG, 99 minutes. Happy Feet is the story of Mumble, a young emperor penguin who lives in Antarctica. Like others of his kind, he needs to be able to sing to attract a mate, but he has a terrible voice. Instead, Mumble must express himself, and lure a female through his amazing talent for tap-dancing. Rated PG, 108 minutes. Categories: Events, Featured, and Kids.